During Open Access week, Belgian universities jointed forced to organize a two-day event titled ‘Open Science on the Move’. The aim of the event was to show how open access has moved beyond it original thresholds and moved toward a global approach of opening up the whole scientific process. Where open access started as a movement to open up publications, it is now both a challenger for traditional publishing models and a topic high on the political agenda. Currently a draft bill is being voted for the Walloon-Brussels region that implements a mandatory depositing policy for research papers. All the presentation are available for consultation at the end of this post. Open access to publications and data started as a grassroots movement driven by researchers and libraries, although it quickly became prone to economic implications and innovations. This not only led to a new type of publishing business model, Open Access also became the object of political prescriptions. The European Commission wants to use Open Science as a leverage to make Europe the most competitive and dynamic knowledge-based economy in the world. Started with soft policy the European commission now boosts their open science aspirations by both stimulating Open Access to publications as well as making data management and open data a feature of every new Horizon 2020 project starting in 2017. A number of Belgian universities are currently joining forces to bring together a number of templates for data management plans on an inter-university platform. Next to data man agement plans, researchers will have to deposit their data (i.e. all information needed to validate results presented in scientific publications) in a data repositories. Some examples of open data platforms and referencing website are Re3data.org, Zenodo, CESDA, ORFEO (for BELSPO-projects), etc. During a dedicated session, a number of Belgian universities discussed some best practices on the basis of their own experiences with their institutional repositories. In general, it is important to make sure researchers grasp the added value (‘findability’, exposure) of providing the necessary information for the repositories. At a national level, the ministry will set up a repository for all research publications funded by them in 2017. Because of the increased influence of Open Science policy, the importance of university associations to represent the universities with one voice at the EU-level is growing. These organizations can on the one hand take on lobbying and on the other hand assist member universities in their daily practice. Examples of these associations are Cesaer, Leru and EUA. The Commission has recently also installed an Open Science Policy Platform and by the end of 2018 the General Data Protection Regulation will be passed, which will obligate universities to appoint a data protection officer. There was also attention given to the legal aspects of open science. Licensing, data regulations, creative commons and predatory publishers were discussed during a world café where the participants had a change to ask their questions directly to the invited experts. An important question posed during the two days was which road to Open Access is preferable, green or gold? At a European level, the Dutch presidency has published the Amsterdam call for action and put forward the gold route with traditional APC’s. Because of this, there is the risk of a new digital divide (gold for the “rich”, green for the “poor”) where the richer institutions and scientific disciplines have a wider range of possibilities. This makes way to the possibility of hybrid journals, which often go for double-dipping. The consensus in Belgium seems to be that the green route is the most preferable. Diamond Open Access is also a possibility where public funding and other business models replace APC’s. Controversy over assessment makes way to new ideas about evaluating science, leading to new publishing models. There is for example the ‘Self-Journal of Science’ edited by Michael Bon. The starting point is that science should be transparent, unambiguous and falsifiable and therefore subject to peer review and evaluation. When researchers publish their own articles in an online journal, reviewing and evaluation is managed by its users. This way, a new community model emerges which gives way to a natural economy of science. The value of your research stems from the recognition for your work. Blogging and social media are therefore good addition to open access publications. Openness is in the self-interest of researchers. Another method for open evaluation is open peer review. During a panel discussion with different journals, it became clear that classic peer review and open peer review are not two opposites, but that there is a scale of openness for review: you can disclose the reviewers and authors to each other, you can put the names of the reviewers online, you can put the actual review reports online or let people review openly online. The perceived challenges for open peer review are that reviewers will be less critical, young researchers will not dare to review, and that researchers will suffer more openly from an ‘impostor syndrome’. In reality, the quality of the reviews is often higher, but currently the incentives for authors are often lacking, not only for open peer review, but for peer review as a whole, as it is not in the academic reward system. Some other ways to promote recognition were also discussed, such as ORCID. This is a unique personal identifier. It is to be expected that the European Commission will implement this ID within a few years. The Flemish universities have acquired an institutional ORCID to allow linking with their own repositories. In conclusion to both days it was stated that the original sin of science is to subcontracted part of the scientific process to the industry, i.e. the publishers. Researchers should themselves decide when their research is ready. More non-traditional self-promotion (f.e. social media), preservation (repositories, publishing as much as legally possible without the use of traditional publishers) and evaluation (altmetrics, downloads,…) is needed. 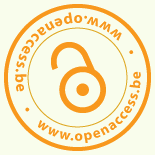 With regard to open access itself, the green road is the most democratic and therefore preferable. But it is important to take into account the following: every institution should have its own repository, all the available content should be in the repository and all of the content should be open access. Presentations ‘Open Science on the move’ on 25 October 2016.